So I just installed new Fortune Auto 500 coilovers on my car. After I aligned the car, I was drive home and hit a moderately sized pothole (driver side) which I could immediately tell threw off the toe/steering in the driver front (steering was leaning left while car traveled straight, implied driver front was toed in). When I got home I could tell the driver front was toed in, it also looked like there was quite a bit more camber as well, I figured the camber would come out when I fixed the toe. I roughed in the toe with (2) pieces of angle iron and (2) tape measures. The toe was roughly 5/16" off (equated to approximately .80 degrees toe in from trigonometry) but the camber still looks very far off, despite the camber plates AND the camber bolt being in the exact same position from Passenger to Driver side. The toe is close enough to where the camber shouldn't be visibly off like it is. I'll go back and re-align the car once I'm sure nothing is damaged. So I got under the car and started to inspect to see if something was bent or tweaked. The LCA appeared to be straight, tie rod was straight, knuckle/wheel looks fine etc. Nothing really seemed out of place. I noticed that the ball joints looked slightly different (see below). 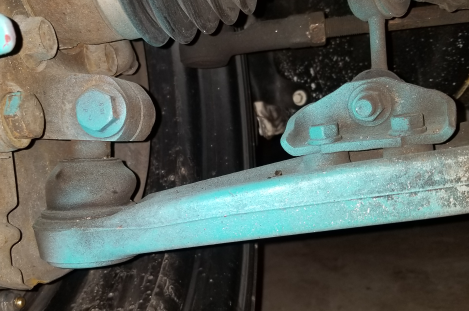 Does anyone have an explanation as to why the Passenger side ball joint looks inflated and clearly farther out from the knuckle and the driver side the boot is deflated and touching the knuckle? I know there's a groove on the ball joint shaft where the bolt slides in, so these should be in the same location, right? I removed the LCA on the driver side and the ball joint appears to be in fine condition, it moves freely with some slight resistance, there's still grease present, etc. Excuse the over spray, its from painting the brembos. Passenger side balljoint looks "ballooned" because it's not crushed down from the upright touching it. You are correct that those balljoint shafts have a groove in them for the bolt. 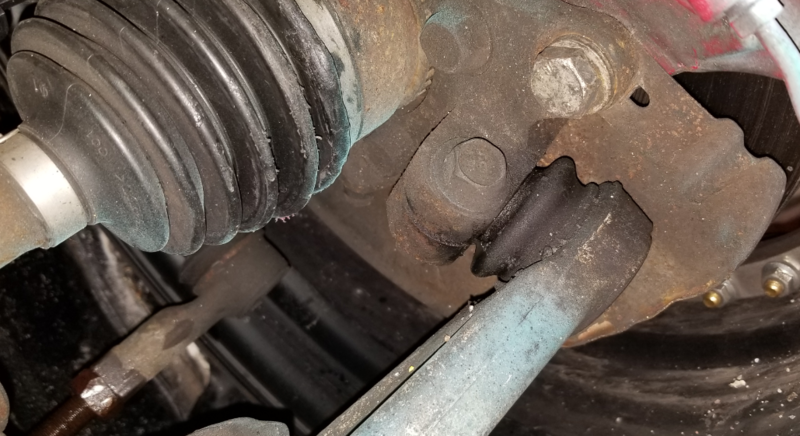 Either the passenger side balljoint shaft isn't fully seated and the bolt is above it or that's an aftermarket balljoint with some roll center correction. You need to take off that pinch bolt and see what's going on at the knuckle connection. The tie rod which is only 13mm in diameter looks straight as an arrow. That had to be the first thing to bend. I would guess this is part of it. The pass ball joint doesn't look seated. It also looks over filled which is why its all ballooned. I would separate, replace the boot, reinstall at a minimum. But as to why your toe changed and looked like camber changed, its probably because your camber DID change. There is slop in the mounting of the strut to the upright/knuckle and a hard enough hit or low torque on the bolts can move it. And if you change camber, you definitely will move toe. Heres a quick vid I posted a while ago to show the slop. Indeed the passenger side (non-pot hole side), the previous owner didn't seat the LCA at some point. The bolt was sitting on top of the shank and only clamping force was keeping the ball joint in. It was however incredibly seized up and was WAY harder to get off than the driver side properly-seated-ball joint. Took it off, re-seated it properly and all is well on that side. This didn't seem to affect much on the passenger side of things. Dallas-J - thanks for the info, my next step was to switch the coilovers from each side and see what happens, in doing that I will have to un-do the camber bolt and potentially re-do that slop in the strut you are referring to. I find it best to put a jack with a block of wood under the rotor to bias everything fully inside when tightening the strut bolts. If you have uneven left/right camber then its the subframe itself that needs to be shifted but you can fake it with using adjusting one side of the strut/hub bolts. You would adjust which ever side has more camber. I'm going to swap the coilovers tomorrow and see what happens with re-seating the camber bolts. Like I said earlier I seriously doubt I bent or twisted something. Everything from the LCA, tie rod looks straight and true, so I can't image that I bent the knuckle, subframe or anything. I hit a mild pothole, I didn't slam into a curb a 30 mph. I'll update tomorrow night after messing with the coilovers. You were right. Both bolts were towards the outside of the car when I installed the coilovers, when I hit the bump on the driver side, it slide the bolt back adding more camber. I removed the coilovers and re-installed using the jack to make sure on both sides the bolt were slid as far back (maximizing camber) as possible. Now both sides look the same, however, have quite a bit more camber then when I aligned the car, so I'll need to go back and align it using the camber plates to take some camber out of it. Other news, I tore an inner CV boot now I'm struggling to remove the axle from the hub as it's really seized up so I can replace it. Rent a wheel hub bearing puller. Mine were seized as well and that was the only thing that worked to push it out. I used this same one twice from autozone, u can rent it. Is it normal to have a marginal amount of oil leak from the tcase after pulling the passenger side axle? Nevermind, pretty sure it's normal, I jacked the car a bit higher on the passenger side and it stopped. PSA - if you can't get the axle out of the hub, just remove the entire knuckle and axle and bring it to a local machine shop and press it out, it's much easier. Interesting thread, I installed Fortune 500s last weekend and my drivers side camber has "adjusted" itself 2x now due to the slop mentioned above. The specs say 81.8 ft-lbs, but I read for Evo 8/9 it's like 123 ft-lbs. Thinking 82 isn't enough.... God knows it was a total ***** to get off, but I was assuming that was due to bolt corrosion. Anyone got a recommendation on how high to torque the strut/knuckle bolt?